Standard Waffen SS uniforms were worn. As the 1st Ski battalion was mostly made up of Hungarian mountain troops the Honved mountain troop edelweiss badge was worn on the left hand side of thr Gebirgsmutze. 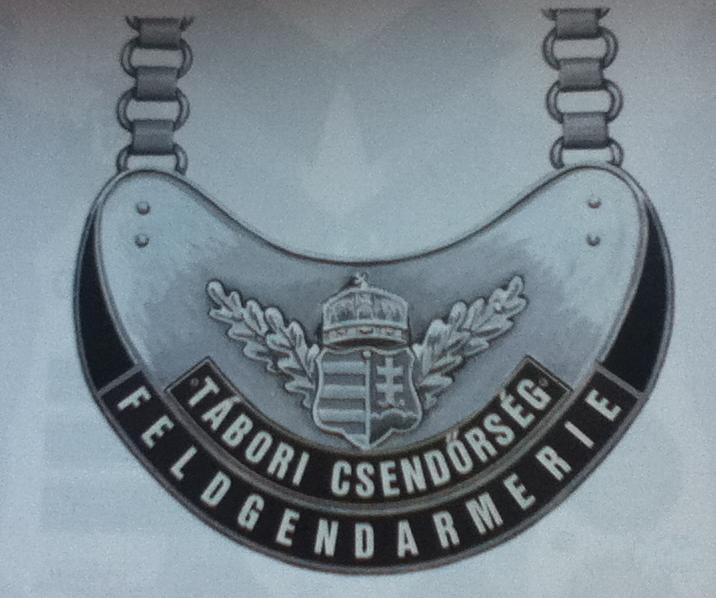 Any medals or honours that had been presented during the soldiers time serving in the Hungarian army (including the Gendarmerie) were allowed to be worn. Camouflage (Tarnbekleidung) was issued to the 1 Ski battalion. 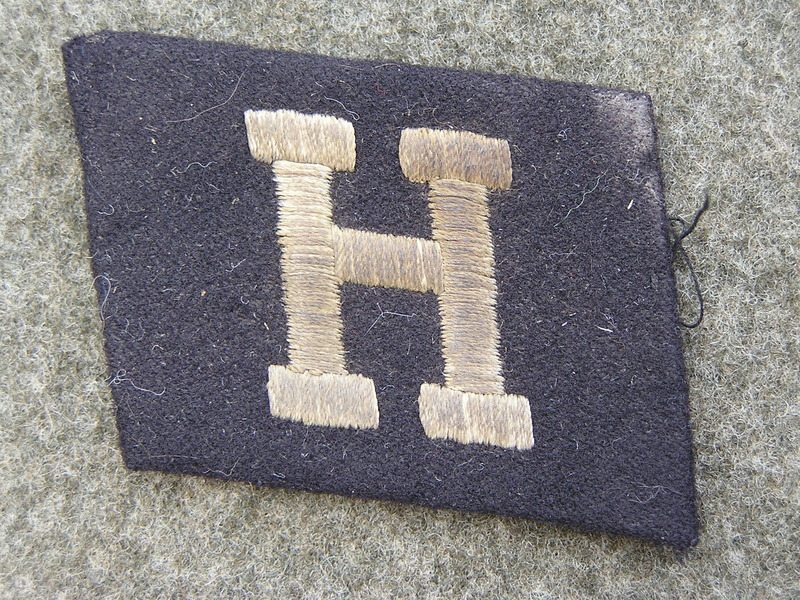 Hungarian insignia issued - 3400 Hungarian produced 'H' collar patches were issued to and worn by members of this unit. 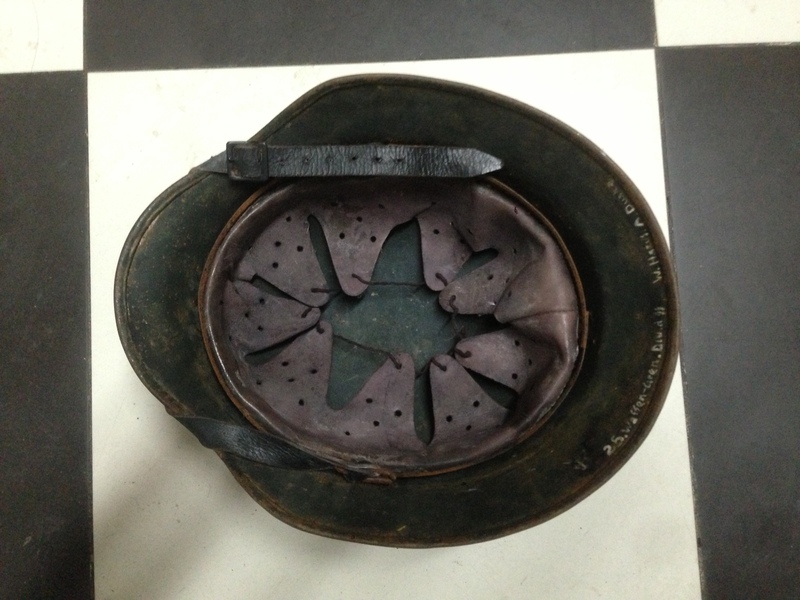 The enlisted men received 2 pairs and the officers 3. Originally German rank insignia was to be worn but at the request of the men Hungarian Honved 6 pointed star rank insignia were worn. Private purchase riding boots and the 'Bilgeri' (2) style boots were also worn. Honved Officer buckles were also worn. German insignia issued -The majority of I & II battalions wore the 22. SS Division (commonly know as ,,Maria Theresia”) standard cornflower collar patch. The remaining members of SS Brigade ,,Ney" wore the standard 'SS' collar patch. 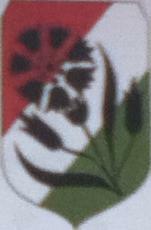 Hungarian insignia issued - none. 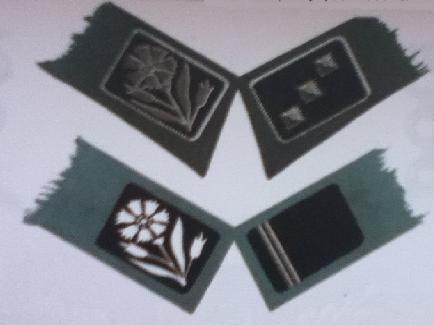 Hungarian insignia issued - A small amount of home made arm shields with a cornflower on the Hungarian colours.were worn by members of SS Brigade ,,Ney" (No photographic evidence has yet come to light to confirm this) the majority of men did not wear any armshield. German insignia issued - none - although Adolf Hitler gave permission for the unit to be issued with one in January 1945. Some members of SS Regiment Ney wore a badge consisting of a deaths head with 2 crossed swords (the swords doing the same as the crossed bones in a skull and cross bones) There are two types, the difference being the type of sword forming the cross. This was worn on the left breast pocket. Some of the members of SS Brigade ,,Ney" wore brown leather coats and Honved officers buckles and belts. In winter a black sheepskin mutze was worn which had the deaths head badge on. Privately purchased Hungarian riding boots along with the 'Bilgeri' type of boots were worn by members of the brigade. 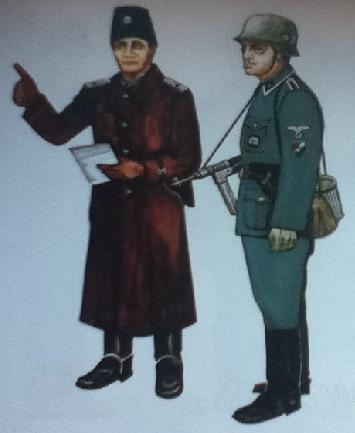 Standard German issue uniforms. 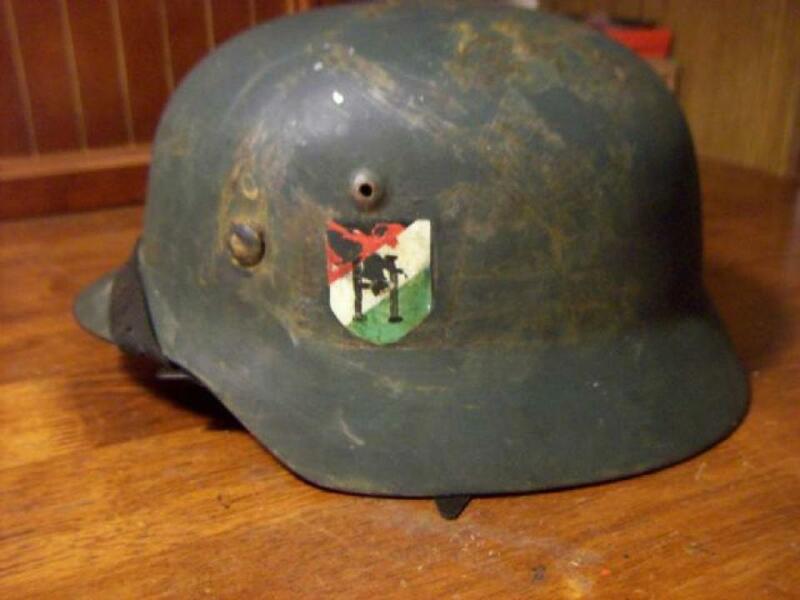 The insignia worn when the unit was kampfgruppe ,,Szalasi” is unknown. When taken over by the 31. SS Division it is assumed that the divisional insignia would have been worn. Due to ,,Hunyadi" originally being planned as a division of around 12 500 men there was a shortage of standard Waffen SS uniforms (uniforms were issued from 02 November 1944 - 31 December 1944). The short fall was made up by the issue of other uniforms and by the wearing of Hungarian Honved uniforms. On 26 October 1944 an order was issued which included the following notes on the uniforms for the ,,Hunyadi" division - "the Hungarian crest will be worn on the upper left arm and the name of the division on the left arm". 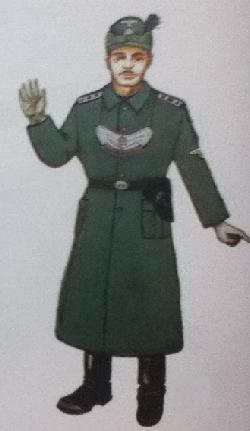 On 10 November 1944 a document was issued that stated that a Hungarian (style) uniform made from German material will be issued to the division (3). This is replaced by a document dated 24 December 1944 stating that the division would be issued Waffen SS uniforms made from German material. The final order concerning uniforms was issued on 14 February 1945 which stated that the division would wear standard Waffen SS uniforms but with their own collar patches, armshield and arm decoration (cuff title). 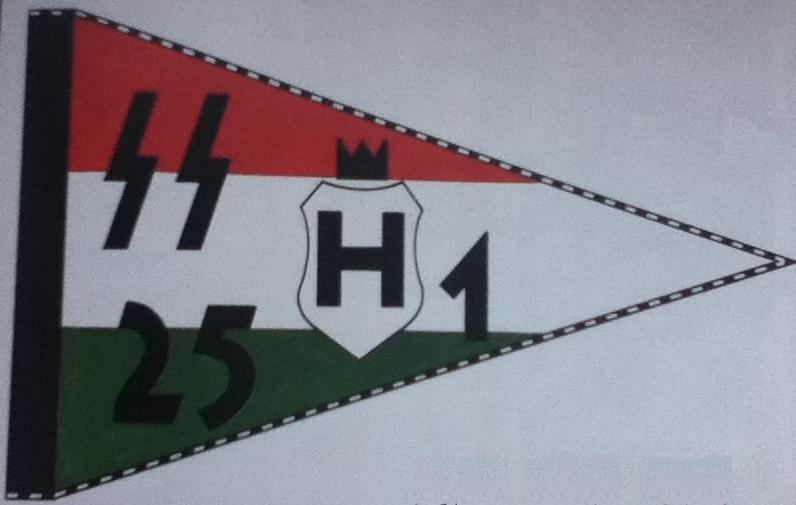 Hungarian Insignia Issued - 'H' patches were issued (please see Hungarian SS collar Patches section below). Home made patches were also worn (both embroided and some made from tin plate), blank patches and standard SS (double sigrunen) were also worn. Hungarian Insignia issued - A limited number (please see footnote 3 below) were produced and issued to the division. The script used was the same as the 'H' collar patch (antiquaform). No photographic evidence has yet come to light to support this but sources in Hungary state that a photo exists of 2 rows of men on parade wearing ,,Hunyadi" cufftitles. A veteran who was present during the visit of Heinz Fanzlau and Gottlob Berger to the Neuhammer camp to review ,,Hunyadi" and ,,Hungaria" states that prior to the visit ,,karcsíkok,, (Name strip - cuff title) were issued to the honour guard and that after the visit the cuff titles were taken back . 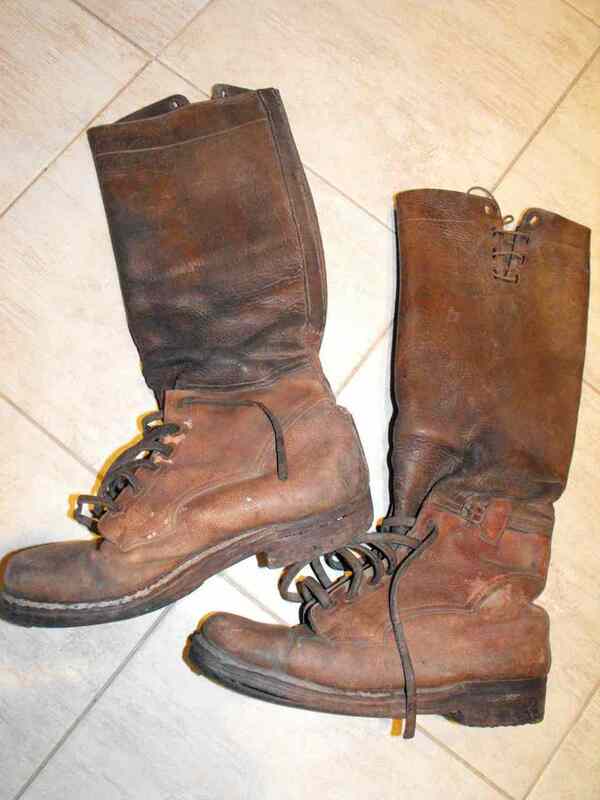 Hungarian Honved officers riding boots and trousers were worn as was the Bilgeri style of boots. The wearing of mixed uniforms (German tunic - Hungarian trousers or vice versa) was prohibited by an order being issued but this may not have been adhered to. Hungarian 'Barras' jackets were worn as was the sleeveless 'Peizwestern' style coat. Hungarian pistols and holsters (these being natural colouring) were worn (the holsters on the right as in the Honved and not on the left as in the German Army) Hungarian pioneer style boots were worn by members of the division. A 12 point agreement of 14 February 1945 was official confirmation of the various uniforms being worn. 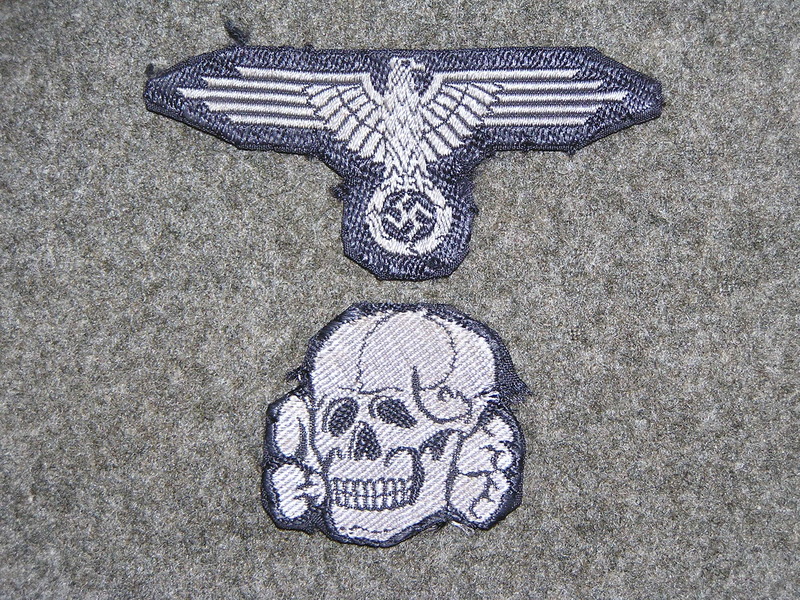 German Insignia issued - According to some sources collar patches were made but not issued. 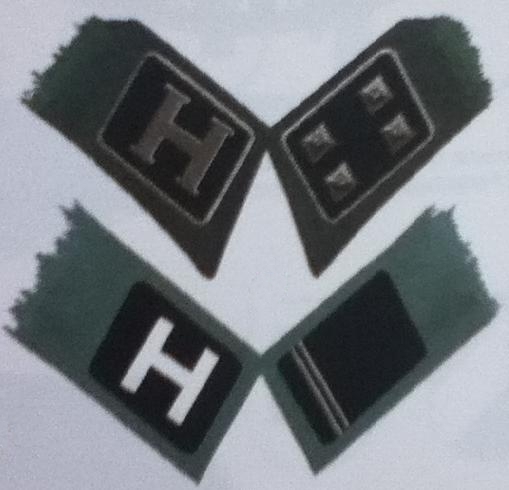 Hungarian Insignia Issued - 'H' patches were issued (please see Hungarian SS collar Patches below). Home made patches were also worn (both embroided and some made from tin plate), blank patches and standard SS (double sigrunen) were also worn. Hungarian Insignia issued - A limited number (please see footnote 3 below) were produced and issued to the division. The script used was the same as the 'H' collar patch (antiquaform). (No photographic evidence has yet come to light to support this). A veteran who was present during the visit of Heinz Fanzlau and Gottlob Berger to the Neuhammer camp to review ,,Hunyadi" and ,,Hungaria" states that prior to the visit ,,karcsíkok,, (cuff title) were issued to the honour guard and that after the visit the cuff titles were taken back . Please see section in ,,Hunyadi" section. In the original orders from October 26 1944 no mention is made of special collar patches for the Hungarian SS units. 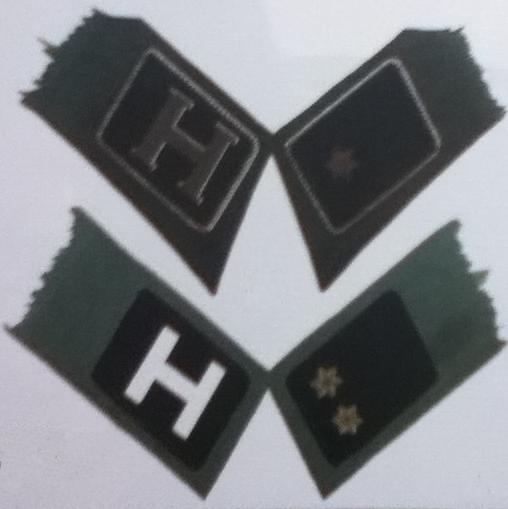 However by the end of 1944 it was decided that the letter 'H' (standing for HUNGARIA - the name for the old larger Hungary) would be worn by the divisions and approximately 5000 'H' patches were produced as a sample by Paszomanygyar in Budapest and issued as follows - 3400 to the Sturmjaeger regiment, 600 to the ,,Hunyadi" division (2 honour guards being issued with the patches and the rest being issued to other members of the division) the remaining patches were issued to other members of the Hungarian SS units. There were Officers (patch with Border) and enlisted mens versions. The 'H' was in the Antiquaform and machine embroidered. In February 1945 the SS Main Office decided that the armshield for the Hungarian SS units would consisit of a shield bearing the word "Ungarn" with the national colours of Hungary (Red, white and Green) underneath. If any of these armshields were made none were issued to any of the Hungarian SS Divisions. Although a decision had been made by the SS main office, in an independent move the Hungarian honvedministerium decided on its own design of armshield for all the Hungarian SS units. This consisted of the word "Hungaria" at the top of the shield. Underneath was the red, white and green national colours. At the lower end of the national colours was the Arrow Cross symbol and above that was the crown of St Stephen. Approximately 1000 pieces were made in Budapest and issued to members of the SS divisions (These were issued to the Sturmjaeger regiment). These were machine embroidered. There was no officers version due to the limited run. 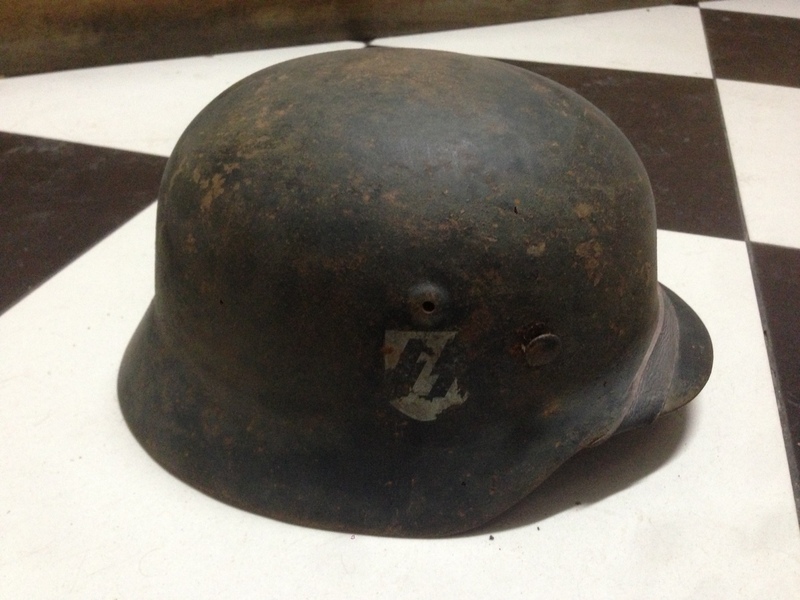 It was originally decided that the helmet insignia should consist of a letter 'H' instead of the SS emblem and the national colours in a shield but no official orders were issued stating the emblems and the siteing of the insignia. 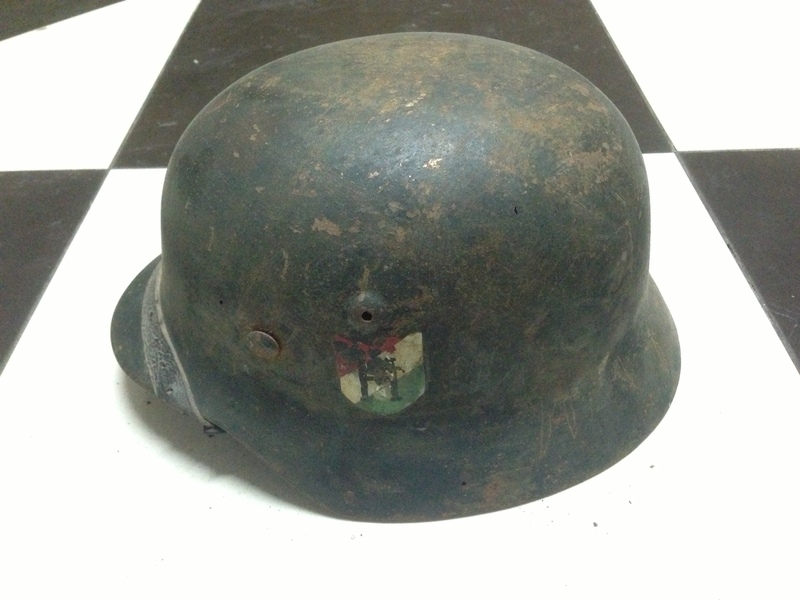 Some members of the two divisions made their own templates for painting insignia on their helmets and some simply painted over the german black -white - red tricolor on former Wehrmacht/Heer helmets with the Hungarian colours. To get out of the mess of differing insignia, it was ordered by the General Inspectorate of the Hungarian SS at the beginning of April 1945 that in future the correct insignia for the steel helmet should be the letter 'H' (white shield, black border and letter 'H') on the right and on the left the Arrow Cross symbol (red border, white middle, dark green arrow-cross). A workshop was created at Roth near Nurnburg for the wholesale painting of the helmets with a spray gun and stencils. The workshop had only just started production when the workshop had to close down due to the area being over run by the allies. In Hungary in 2010 (possibly by a political party for the election) a poster was issued consisting of 2 soldiers. The soldiers were wearing standard 1940's German uniforms and Steel helmets. The insignia on the left hand soldier was the standard SS collar patch and SS insignia on the helmet. The right hand soldier had the 'H' collar patch and 'H' helmet insignia. (1) A veteran who served in the 25th Ski battalion lists his uniform as Italian jacket and gray trousers (country unknown). He comments that he was originally issued Hungarian mountain/ski boots but these where later replaced by German mountain boots and the Hungarian boots returned to the stores. 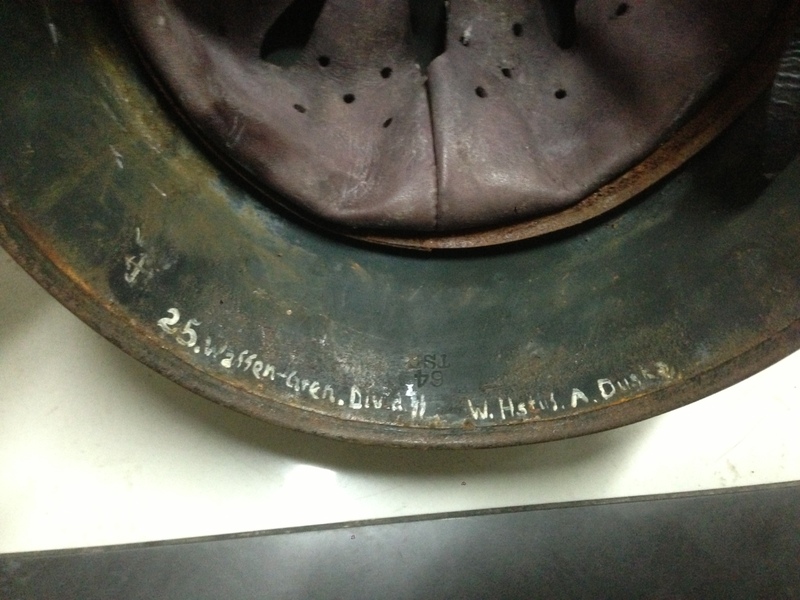 (2) This style of boot was named after former Kaiserjaeger Major Bilgeri. Made from soft leather the bottom part is designed to be like a hiking boot with double soles sewn on. These were originally issued to Hungarian Mountain Artillary troops in 1940/41 and afterwards to officers in the Hungarian motorised troop. (3) One veteran remembers being told this when he first joined the division. In November 1944 a veteran states that at while at Zalaszentgrót when the division was first forming that during a speech given by Grassy that Grassy was wearing a German officers uniform complete with officers hat and that Martin Zoldi was still wearing his Hungarian uniform. He also states that he was given a German uniform complete with sleeve eagle but with no collar patches. A veteran who fought in Berlin at the end of the war states that when he reached Zalaegersyeg that German uniforms were issued. (5) A veteran from ,,Hungaria" states that when originally on the March from Tata and Sur in late 1944 that the approximately 2000 strong group presented a very rag tag collection. The officers had been issued brand new German uniforms as had the majority of the NCO's but the rest wore a mixture of uniforms and civilian clothing. He also mentions that certain soldiers had been issued WW1 mannlicher rifles along with 40 rounds of ammunition.Whilst travelling tp Vienna he states his "uniform" consisted of a helmet, a backpack, a German tunic, knee length trousers, boots and a "Bocska" winter coat. 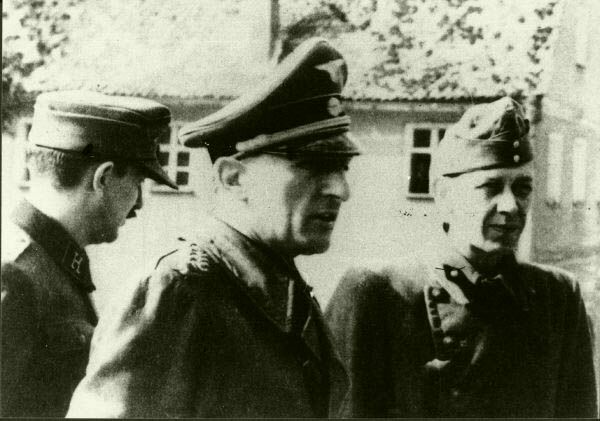 On arriving at Neuhammer camp he was kitted out with a Danish greatcoat, Norwegian winter boots, German cap and under garments and trousers of unknown nationality. (6) In his memoirs Janos Zoltay states that during the battle for Neuhammer members of the battalion commanded by Waffen-Hauptsturmfuhrer der SS Geza Pataki were wearing French Khaki uniforms. Endre Gencz in his book states that due to a shortage of German uniforms members of "Hunyadi" were also issued French and Italian uniforms. 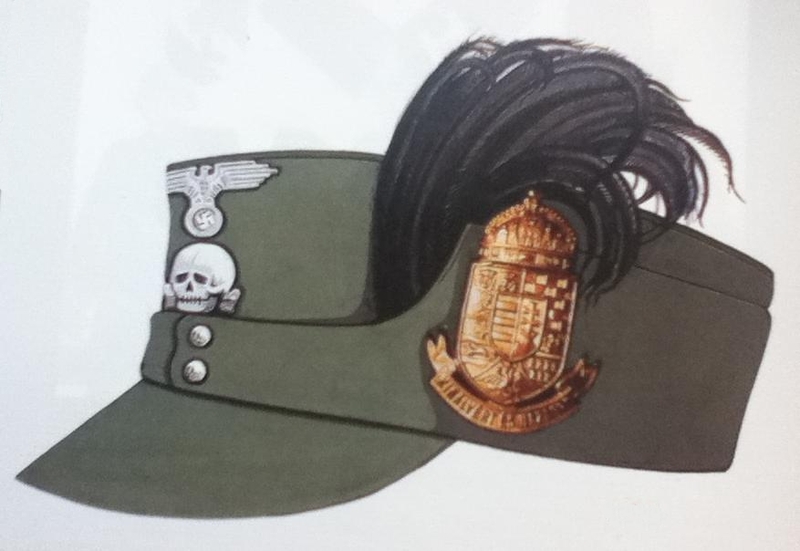 (7) In the book "Magyarorszag es a Fegyveres - SS" A v. Weissenbach (aka A v. Payer) it states that the homour guard at Neuhammer had the "H" symbol on their helmet.